Arsenal midfielder Lucas Torreira was shown a straight red card by referee Anthony Taylor in the final stages of this afternoon’s north London derby. 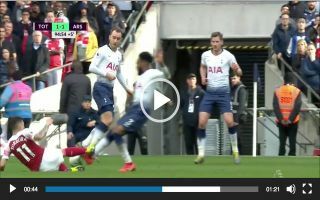 In the 94th minute of the clash, the combative Uruguayan took things a step too far by putting in a high challenge on Tottenham left-back Danny Rose, Torreira’s challenge may not have warranted a red card but it was just far too reckless and it was at a heated stage of the game which may have influenced the referee’s decision. The final ten minutes of the clash were about as dramatic as you’ll ever see. Torreira will now miss Arsenal’s clash against Manchester United, the Gunners had a glorious chance to further their hopes of a top four finish and draw Tottenham into a heated battle with themselves, Manchester United and Chelsea for a spot in the top four.